According to National Society of Health, approximately 26 million patients are suffering from heart failure worldwide, with the increased economic burden of USD 30.7 billion each year. The advent of a novel class of drugs, i.e., the angiotensin receptor-neprilysin inhibitor, gives hope to the patients. Neprilysin is a zinc-dependent metallopetidase enzyme that helps breakdown of the biologically active natriuretic peptides and several other vasoactive compounds. It catalyses the degradation of various peptides including atrial natriuretic peptide, brain natriuretic peptide, and bradykinin, as well as contributes to the breakdown of angiotensin II. Inhibition of neprilysin is a promising target in cardiovascular disease as it increases circulating levels of Natriuretic peptides. The first neprilysin inhibitor, Candoxatril, was developed by Pfizer during 1998. However, the drug was discontinued in Phase III stage due to lack of efficacy and side effects. Then, in year 2000, Bristol-Myers Squibb developed Omapatrilat, but the drug was also not able to pass FDA review due to lack of efficacy. In the year 2001, Bayer discontinued the development of Ecadotril in Phase II stage after disappointing results. Around 2004-2005, Pharmacia’s RAAS-NEP inhibitor, Eplerenone (Inspra), did not receive FDA approval due to angioedema side effects. After 10 years, Novartis Pharmaceuticals’ drug LCZ696 found success in Phase III trials. It has demonstrated greater efficacy than enalapril in a phase 3 trial assessing heart failure with reduced ejection fraction. It is composed of 2 molecular moieties in a single crystalline complex—and possessed the ability to inhibit the renin-angiotensin-aldosterone axis and augment the endogenous natriuretic peptide system to provide a distinctive mechanism of action in cardiovascular disease. Theravance Biopharma is also working on developing TD-0714 neprilysin inhibitor product. The company has completed Phase I trial of TD-0714. The market of neprilysin inhibitor is gaining success from year 2014, after long time of failure since 1990s. The hope is still present that it can be a new era of treatment in heart failure therapy. This entry was posted in Articles, Uncategorized and tagged Cardiology, drug development, Heart failure, Inhibitors, Neprilysin, Pharma. DelveInsight, leading Market Research and Business Consulting firm has an expertise in providing business solutions to Pharma and biotech companies. DelveInsight has 400+ Indication API reports on wide range of therapeutic area such as Oncology, Cardiovascular disease, and Autoimmune disorders and Infectious disease. 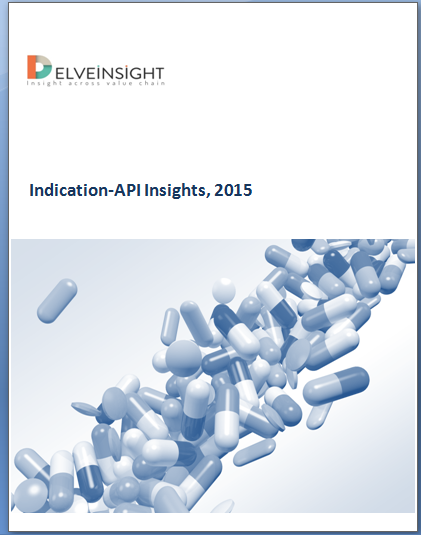 DelveInsight’s Indication API insight report provides global competitive and therapeutic assessment on marketed drugs, API manufacturers, patent expiration and exclusivity. The report gives clear idea on the United States Drug Master File (USDMF) and Europe DMF filed by worldwide countries. These Reports gives complete information on marketed drugs along with Global API Manufacturers and regulatory filings across Europe, US, India and China. It gives information of global Market therapeutics scenario, regulatory information, marketing status and detail of product profiles for marketed products with complete description of mechanism of action, therapeutic class, target, route(s) of administration and chemical description. The Report also provides Global drug sales forecast up to 2016. The Reports give opportunities to generic manufacturers and also helps API industry to track closest competitors and prioritizing new drug intermediates to add to the portfolio when drug goes off patent. The Indication API insight report helps to identify the strategic drivers and market opportunities. DelveInsight is a leading Business Consulting and Market Research Firm. We combine industry expertise with probing market insights in innovative ways to deliver critical information to leading decision makers. This entry was posted in API Business Opportunity and tagged 400+ Indication API reports, API Indication reports, API Intelligence, API Manufacturers, ASMF, Autoimmune disorders, Biotech, Cardiovascular disease, China, DelveInsight, EDMF, Global drug sales forecast, India, Infectious Disease, off patent, Oncology, Pharma, USDMF.